We’re from Iowa and I realize that what we consider to be “hot” at this point in our lives is not the incredible heat and humidity we experienced in our youth. However, I asked one of our Iowa guests this week if our current weather is “Iowa” hot and she confirmed it is…so I feel justified saying, “Holy Cow – it’s hot! !” In fact, we postponed Monday’s potluck for the first time in 13 years due to heat. We’ve canceled for rain before but never heat. 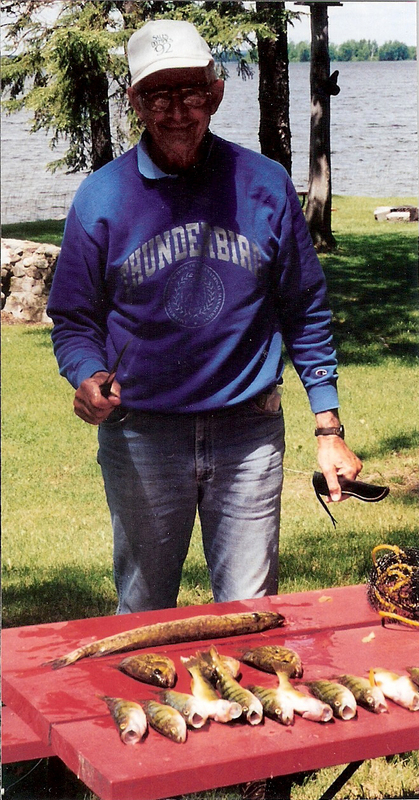 No worries, though, we’ll sneak potluck in tonight…Jay and I don’t miss out on great food cooked by other people! The good news is that if you are on vacation at Wildwood this week you are a happy camper. (pardon the pun!) 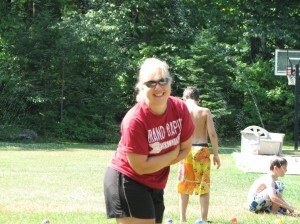 Hot and sunny outside means great days to lay on the beach, swim in the lake and go tubing! Then you can go back to your air conditioned cabin when you are ready for a break from the heat. Today is starting out absolutely beautiful with cooler temps and a pretty, blue sky! Our supervised Kids’ Activities were all about water this week. 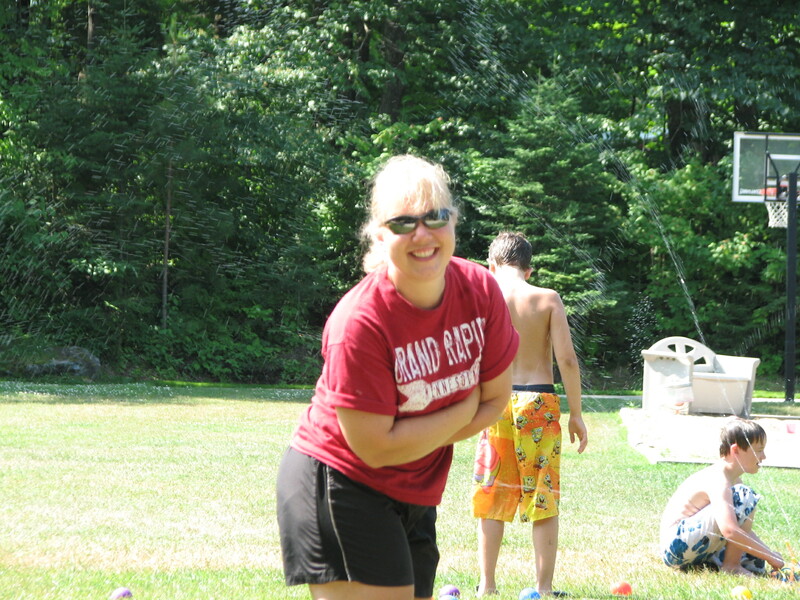 The kids played a variety of water games and Krista took them down to the beach when the kids got tired of playing with the sprinkler on the ball field. We are so lucky to have Krista Sjostrand come out twice weekly to play with the resort kids. She does a great job! Our indoor project this week has been to find a way to use our old fish photos. They’ve been sitting in a photo album in the Lodge buried under the Bocce Ball set and a few bean bags. Not doing much good! 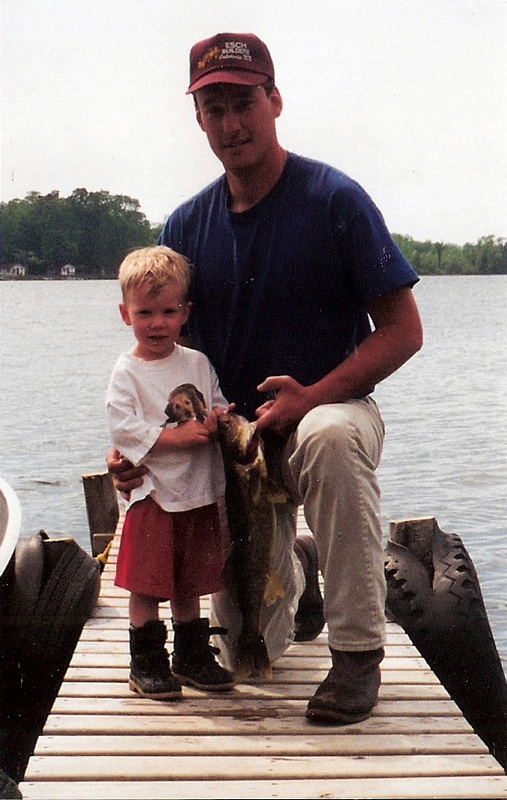 So Jay got the wild idea to crop them and laminate them for use in the fish cleaning house. It has been so fun for us to look back over 13 years and remember the people who have made our first decade at Wildwood so special. While it was enjoyable it confirmed what our backs have been telling us for a few years….we are so old…because many of the babies we see in the early pictures are now in middle school! And a few of the kiddies are even out of college. Yikes! The baby eagles have finally gotten their “wings” under them and are flying with the same grace as their parents. We don’t see them sitting in our trees anymore but it’s still fun to see those beautiful birds soar overhead. It would seem it’s time for them to leave the nest, though, because Jay saw the parents chasing the young away from the nest this week. I guess it truly is time for them to fly! 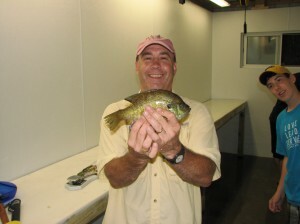 The hot weather has slowed down the fishing just a bit but our guests are still finding big sunfish! We hear that those jokers down in Minneapolis have decided to put the state back to work. Visitors to Minnesota can once again buy fishing license and The Forest History Center will reopen on Saturday, July 23rd. Hopefully the entire state can get back to business quickly! Mississippi Melodie Showboat performances continue this weekend and next and the last weekend of July includes many fun area activities and festivals: 56th Annual North Star Stampeded, in Effie; 27th Annual Northern Cruisers Car Show and the 4oth Annual Northern MN Itasca Vintage Car Club Show & Swap Meet. 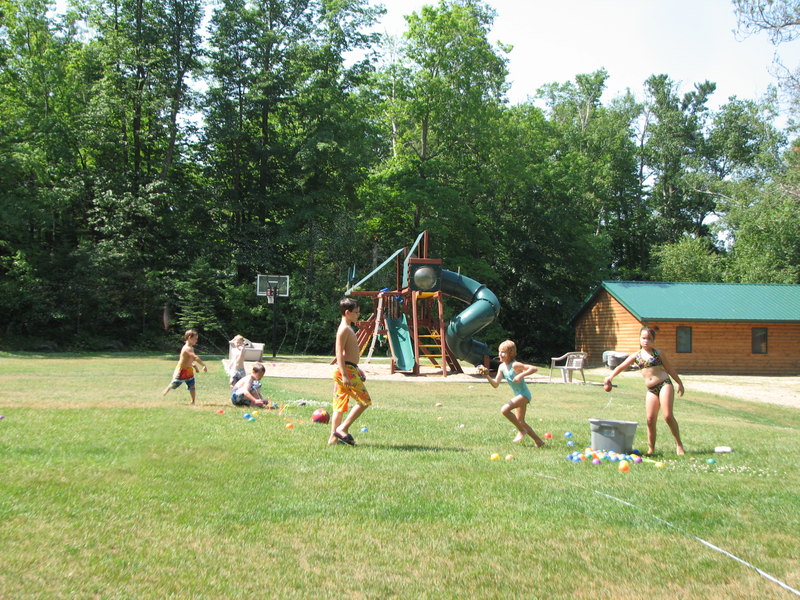 We still have an opening the week of July 30th week in Red Pine Lodge. We are discounting that cabin to $1700/week for 1-8 people. (normal rate is $2495!) It’s a great opportunity to slide into a Minnesota family vacation! We also have White Pine Lodge open the week of August 6th to August 13th. Give us a call today if you have interest in a stay with us. 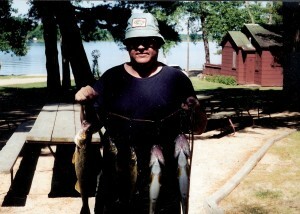 Or please pass on our openings to those you know who might be able to plan a last minute Minnesota vacation! Have I mentioned that we are also on Facebook? “Friend” us and you can see even more photos of life at Wildwood Resort. Have a great weekend! Tom (with his catch in 1999) and his family are long-time Wildwood guests! Our sweet Kodi in 1999 before he was even a year old. 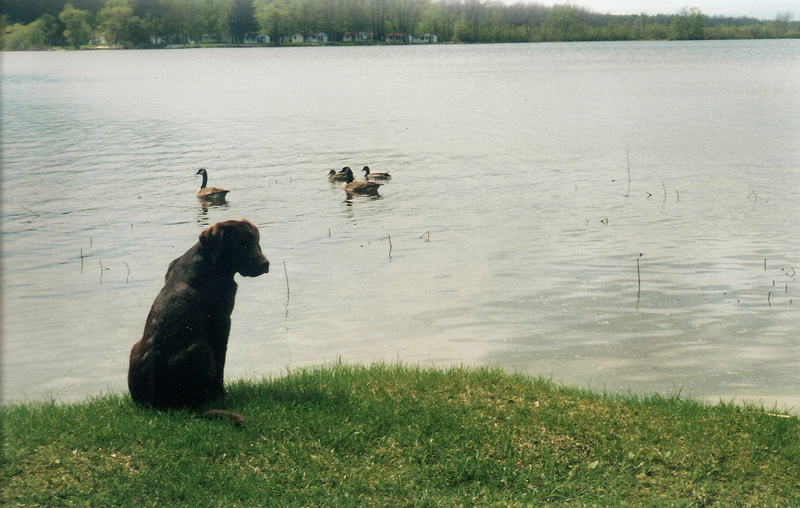 I remember snapping this photo – he wanted to charge those geese!